It can be repeated again and again that the Moto Guzzi twin was developed to power a 3 wheel tractor, but when you see the V7 Sport who cares. 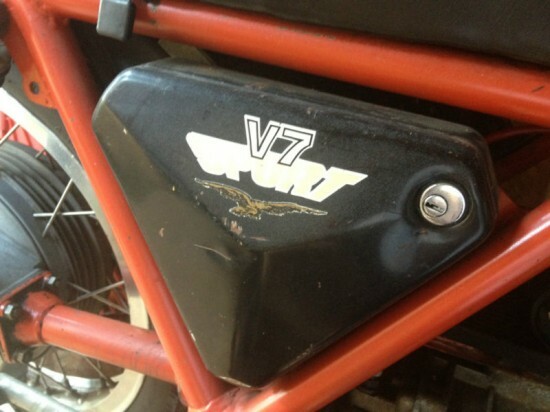 This 1973 Moto Guzzi V7 Sport has the frame, the engine, a shaft, and 4 leading shoe brakes. So when people complain about its heritage, just twist the throttle and leave them behind. 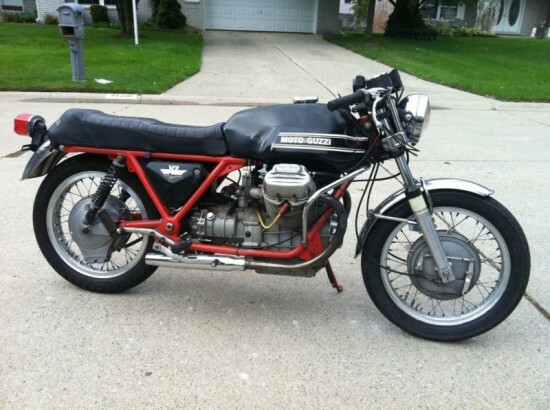 1973 Moto Guzzi V7 Sport. This bike runs well and is mostly complete. Numbers matching. I bought it from the second owner, it spent the past 25+ years in storage. I don’t know much of the history, but do know the owner I purchased it in 1979, I have that paperwork and will include with the purchased (a MI title from 1979). The bike comes with one ignition key and one tool box key that fits both tool boxes, and valid Michigan title in my name. All drive train fluids are fresh, I removed and cleaned out the oil pan and changed all the fluids, oil, trans, and differential. The bike started easily, runs strong and shifts good. Included are new throttle cables and carb rebuild kits with new choke assemblies, I planned to replace but if ran excellent without so never got to it. Also included are all parts required to mount the center stand. The paint on the gas tank and side tool boxes is original, but the frame was repainted red long ago. There is a small dent on one side of the gas tank just behind the forks where it appears the fort stop failed, and a small one on top(see pics). New clutch cable, petcocks and fuel line assembly. Currently the gas tank is off the bike, I had removed and drained it prior to storage last fall. If you would like to inspect the bike I will install the tank and start the bike, no issues, runs strong. No battery is included. There is a very small chip of alloy missing from the front hub, an easy repair (see pic). Trying to be honest no surprises. 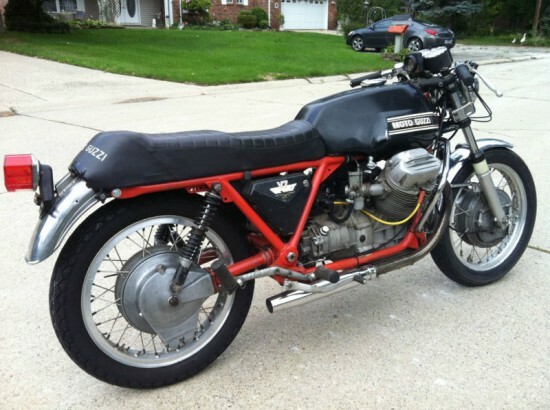 I’m not the Guzzi expert so I’m sure some of you can chime in here after seeing the pics. This will make a very nice original survivor rider with little effort, or is a perfect candidate for those who want to do a complete restoration. This is a fine example of a very rare model that do not come up for sale very often… most likely the only one on eBay. Please feel free to ask questions. After the tractor, the V twin found its way into a Lino Tonti frame, turned a shaft drive rear end and became the 700cc Moto Guzzi V7 Special in 1967. 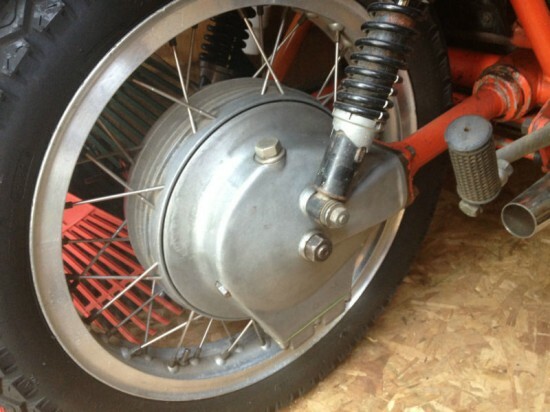 By 1971 the Special had grown in size to 747cc and become the Sport. 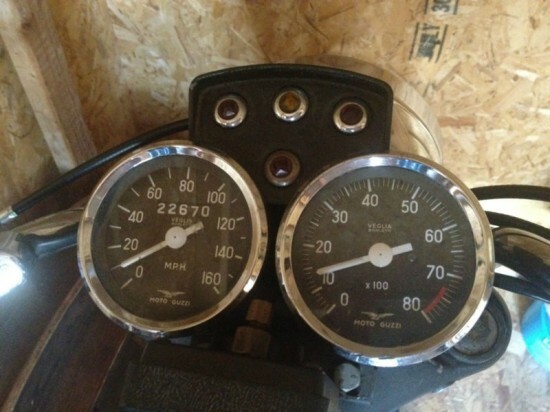 Lightening the Con rods, valve train, and 30mm Dell’orto’s powered the sport to 52BHP at 6400rpm. Combining the more powerful engine into a low and rigid trellis frame allowed rider and bike to do what riders on bikes love to do.